As with most items in the materials handling industry, it is important to consult a pallet rack distributor when trying to choose a rack or rack system. Maximizing warehouse storage is a must. This is why most warehouses utilize pallet racks, which allow businesses to better take advantage of the vertical space of their facility. But what type of pallet racking should you select: new or used, push-back or drive-in, gravity flow or cantilever? As with most items in the materials handling industry, it is important to consult a pallet rack distributor when trying to identify the rack or rack system that best suits your needs. What Are the Benefits of Pallet Racks? Maximize Storage Space: Most warehouses have limited floor space, but a plethora of untapped vertical space. Pallet racks allow business owners to tap into that vertical space, extending storage from the warehouse floor as high as the ceiling. This also helps maximize floor space and forklift or stacker That’s what we like to call a win-win. Accessibility and Convenience: Pallet racks are designed for convenience and accessibility. These racks can be easily accessible by forklift or stacker from both ends and on either side. This helps boost productivity, which can, in turn, increase profitability. 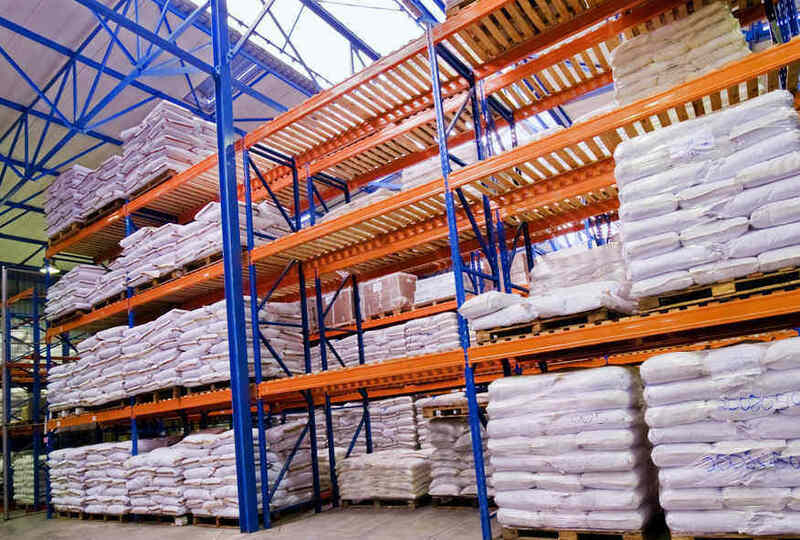 Warehouse Safety: Pallet racks also help improve warehouse safety. These racks are made of high-quality steel, rated for certain loads, and built to withstand the rigors of warehouse use, ensuring they can handle the weight of your pallets and products. Looking for a Pallet Rack Distributor in Maryland? The S.W. Betz Company, Inc. has been providing businesses in Maryland and beyond with all of their essential Weighing, Material Handling, Dock, and Warehouse equipment since 1933. We are a proud Husky Rack and Wire pallet rack distributor and also have many sources for quality, used pallet racks. From the design or your warehouse’s pallet rack to the installation and completion of the project, we provide a complete turn-key solution. We also repair pallet racks. If you have any questions, please contact S.W. Betz by calling 410-574-1414 or 800-332-0322 today! You can count on the S.W. Betz Company to work with you and provide you with our extensive knowledge of the industry. This entry was posted on Tuesday, September 22nd, 2015 at 5:39 pm. Both comments and pings are currently closed.